I bought this book as a gift for my granddaughter who spent four months living in Kenya as part of her International Studies major. She loves the Kenyans and especially the family with whom she lived, and as she is also a pretty good cook, I know that she will try the recipes. Were I writing this book I would have formatted it somewhat differently (so what else is new? ), but it is an interesting read, and many of the recipes look delicious. I, myself, love Ethiopian cuisine because of the spices. I am always open to new foods that do not include rather too esoteric items (brains, eyeballs, insects and peculiar sea life), so this book really fills the bill. It has excellent vegetarian recipes many of which I will copy before I gift the book to her. In addition, there is quite a lot of interesting information about the various areas of the African continent and the people who live therein. That makes it a double bargain. I am sure that she will enjoy this, and I will ask her to write a review when she has actually tried some recipes. 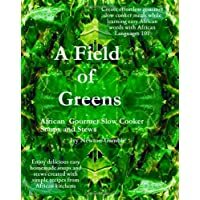 Want to learn more information about A Field Of Greens: Gourmet African Slow Cooker Soups And Stews?